We love how Chris Tragert from Venice Choppers describes his custom bobber; “This bare-knuckle venice bobber is a product of its environment. A light, compact weapon needed to slice through the traffic-choked urban sprawl surrounding the sea-side oasis where it was conceived. Lightweight, quickness, agile handling, and good brakes were top priority. The resulting menacing appearance would give murderous cagers something to text about”. 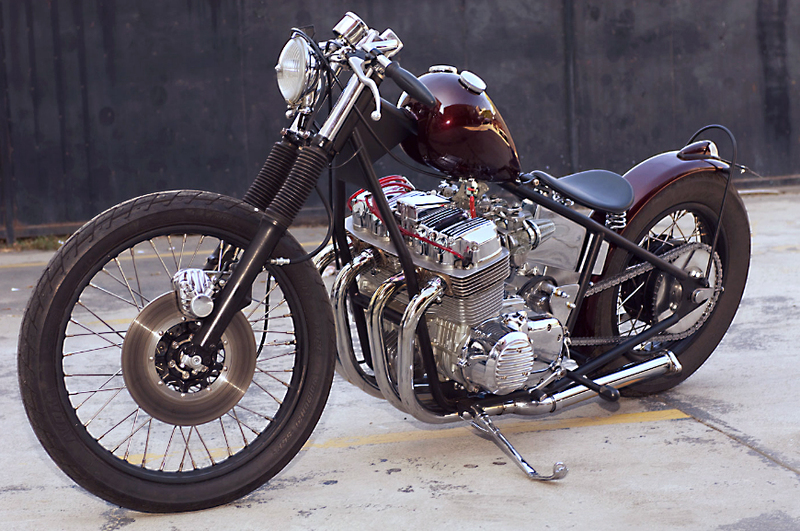 This mad candy red bobber has the unmistakeable 78 CB750F motor. Stripped down and rebuilt with stainless hardware. Love those pipes and we bet they make a great bark. For a full list of the specs (written beautifully by the way) check out their website or for more pics visit the gallery.